All metered services will be read the first of every month. Bills are mailed the last day of the month and are due by the 15th of the following month. Failure to receive a bill does not relieve your responsibility to pay by the due date. Current charges are due and payable as of the due date. All previous balances are due immediately, and subject to disconnection at any time. After the 15th of the month, the bill is delinquent and a penalty of 5% will be charged to your account. A late notice reminder will be sent with a due date of the 30th for all delinquent charges. Postmarks will not be honored. Any balance remaining on the account after the 30th is subject to disconnection of service without notice and a non-payment fee will be added. The past due balance and fees must be paid in full to restore service. New invoices do not extend the payment terms of previous balances. A $30.00 return fee is charged to the account for each item returned by the bank for insufficient funds, etc. Once an item is returned, we will hold it for 2 business days. If payment of the returned item plus return charge is not paid in full within that time, service will be disconnected and a non-payment fee will be charged to the account. The returned item plus any additional fees must be paid in order to restore service. Want to receive your bill notices by email? Simply register through the payment portal and select "go paperless". Or contact our Customer Service Department. Can’t pay by the due date? You have the option of requesting a payment agreement once in a twelve (12) month period to help you avoid disconnection. The payment agreement requires that you pay 25% of the past due amount owing at the time the agreement is signed. The agreement must be signed on or before the 30th of the month. The balance of the past due amount will be due ten calendar days from the date the agreement is signed. If payment isn’t made in ten calendar days, service will be disconnected for non-payment and a non-payment fee will be added to your account. The past due amount plus all fees must be paid in full to restore service. Have you had a leak? The Commission offers a minimal leak adjustment once in a twelve (12) month period. Leak adjustments must be submitted in writing along with a receipt of repair, after the leak has been repaired. Fill out the Leak Adjustment Request Form and return to our office and a Customer Service Representative will contact you with your adjustment amount. 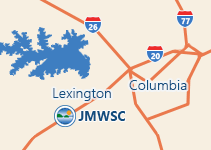 You may email the request to customerservice@lcjmwsc.com or by mail @ P.O. Box 2555, Lexington, SC, 29071. If you think your bill is incorrect, contact the Customer Service Department at (803) 359-8373. This does not waive your responsibility for all payment terms. The Commission prides itself in providing you with the highest quality of water. Should you ever experience an issue with taste, odor, color or any other issue, please contact Customer Service at (803) 359-8373 immediately. We value you as a customer and want you to be happy with the product that we provide. For additional information or helpful hints on how to check for a leak or verify your usage, check out our FAQ page. Has your water bill spiked? Small leaks make a big difference. Here are some ways that can help detect a leak. First, make sure you are not using any water and all home appliances that use water are not running (i.e. : washing machine, ice maker, etc.). 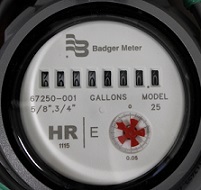 Locate your water meter near the street in your yard, and located in a black box with a lid. 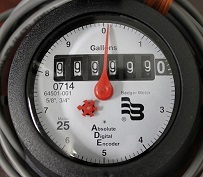 Watch the meter dials for 5 to 10 minutes. Should any of the dials including the red triangle spin or move, then this may indicate that you have a leak. No spinning or movement, no leak. Contact Customer Service at (803) 359-8373 if you would like for us to come out and check for a leak. Number Dials with the white background are collected by the Commission, and printed on your bill. The Commission reads and bills in 1,000 gallon increments. You are not billed for the usage until the full 1,000 gallons has been used. Remove the lid on the back of the tank. Add 2-3 drops of food coloring into the back of the tank reservoir. Do Not Flush. Allow to sit for 15-20 minutes. If any color appears in the bowl you have a leak. Don’t want to use food coloring? Contact Customer Service at (803) 359-8373 and we can send you leak detection tablets. Slow drips can turn into hundreds or even thousands of gallons of water wasted. Depending on how slow or fast your leak is, this can make a big difference in your water bill. When checking for leaks at your faucets, don’t forget the faucets outside your home. JMWSC employees who work in the field are not allowed to take payments. We only accept payments by mail, website, ACH Bank Draft, telephone or our main office. Our field employees will not ask you for payment. JMWSC employees will not come to your home unless you have called the office for a service call, or there is a water emergency. All employees should be in Commission marked vehicles and should be wearing uniforms with JMWSC logo. If Fido can't see it neither can we.